Current Online social networks (OSN) are web services run on logically centralized infrastructure. Large OSN sites use content distribution networks and thus distribute some of the load by caching for performance reasons, nevertheless there is a central repository for user and application data. This centralized nature of OSNs has several drawbacks including scalability, privacy, dependence on a provider, need for being online for every transaction, and a lack of locality. There have thus been several efforts toward decentralizing OSNs while retaining the functionalities offered by centralized OSNs. A decentralized online social network (DOSN) is a distributed system for social networking with no or limited dependency on any dedicated central infrastructure. 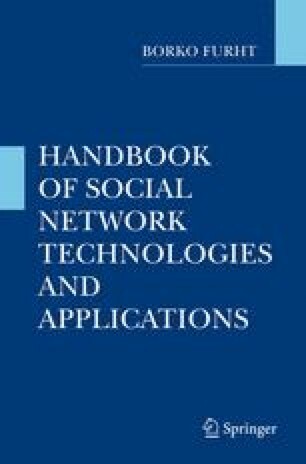 In this chapter we explore the various motivations of a decentralized approach to online social networking, discuss several concrete proposals and types of DOSN as well as challenges and opportunities associated with decentralization. Anwitaman Datta and Krzysztof Rzadca’s work was funded by ACRF Tier-1 Grant Number RG 29/09 and A*Star SERC Grant Number 072 134 0055. Le-Hung Vu is partially supported by the FP7 EU Large-scale Integrating Project OKKAM: Enabling a Web of Entities, contract number ICT-215032. Maria Aspan. Quitting Facebook Gets Easier, Feb. 2008. http://www.nytimes.com/2008/02/13/technology/13face.html. clip2. The gnutella protocol specification v0.4. http://rfc-gnutella.sourceforge. net/, letzter Abruf: 19.04.2007, 2002. Justin Frankel. Waste P2P Darknet, 2003. http://waste.sourceforge.net/. Juan Carlos Perez. Facebook’s Beacon More Intrusive Than Previously Thought, Nov 2007. http://www.pcworld.com/article/id,140182-c,onlineprivacy/article.html. Skype.com. Skype P2P telephony explained, 2004. http://www.skype.com/intl/en/download/explained.html.